Program maintenance is easy with LANSA, and the web solution requires only a thin browser client on the PC. 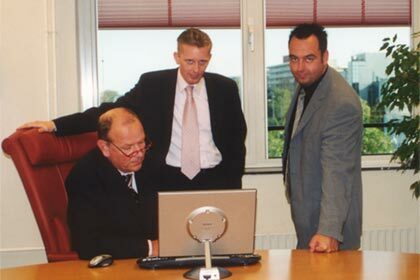 MarktSelect, located in the Netherlands, is a Business-to-Business direct marketing specialist. MarktSelect offers a wide range of services including target definition, mail address cleaning and the execution of mail and telemarketing campaigns. MarktSelect uses LANSA for its browser-based outbound marketing system, which is also offered as an ASP service. Another LANSA-based web service, called U-Select, allows customers to configure and purchase a sales target group by specifying sophisticated selection criteria over an online address database. Patrick Veling, head of the telemarketing department says, "In Outbound marketing customers pay by the hour. To deliver value for money, it is important that we can handle as many quality phone calls in an hour as possible. With the new LANSA-based system we make 15 percent more calls per hour and have better tools to improve our score." We make 15 percent more calls per hour and have better tools to improve our score. Marten de Vries, IT manager at MarktSelect, explains, "Companies can outsource their telemarketing to us, or they can buy address information from us to do their own telemarketing. For most of our telemarketing projects we make the actual sales appointments for the account managers of our customers, but we also use telemarketing to do lead qualification, (prospect-) screening and product sales." "About two years ago, although our core marketing database was on the AS/400, we had very little AS/400 experience left in the company. LANSA was purchased with the idea that it would make it easy for PC developers to develop AS/400 systems. But the IT manager didn't understand the AS/400 and wasn't a big fan of the machine. LANSA just sat on the shelf and the number of poorly integrated PC applications mushroomed." "When I was hired, my goal was to move all those little PC applications back to the AS/400 and use the AS/400 as the central and main IT strategy. My first assignment was to build an Internet application to offer our address database online. The plan I inherited was to copy our database to Oracle on an NT box and build web applications with Java and Oracle. The idea did not fit very well with my IT strategy." "I noticed LANSA materials literally lying on the shelf. We had LANSA tools for the web, Windows and iSeries. I talked with the LANSA office in Amsterdam about our Internet plans. They sent a programmer who did a very successful proof-of-concept for a web solution. This convinced me of the power of LANSA and its capabilities, and I decided to build our Internet application with LANSA." MarktSelect's first Internet project was U-Select, a service that allows customers to purchase a customized address file online. Customers can specify selection criteria for their target group. With each specification the number of records left in the target group is displayed with its corresponding price. If the customer goes ahead and purchases the address selection, a signed order confirmation needs to be faxed and the address file and invoice will be sent. If the order confirmation is not received within three business hours, LANSA triggers a follow-up procedure for the customer to be called by a representative. "This first eCommerce application proved clearly that you can build integrated and complex applications in a short time with LANSA," says de Vries. "We built the complete solution, including links to our RPG order acceptance and accounting systems, in just two months. We had our own re-skilled RPG programmer on the project and one developer from a LANSA business partner for two days per week." The second big LANSA project was the re-development of the core application for MarktSelect's outbound marketing call center. "We have 40 operators in our call center who continuously make phone calls," explains de Vries. "The PC software that we used was slow and unstable and reporting was troublesome as well. We decided to replace this with a browser-based LANSA system." The new application is based on a phone script created together with the customer. The customer selects target companies from MarktSelect's or their own database. When the operator starts the application, the first record of the target group is retrieved and the company information displayed. 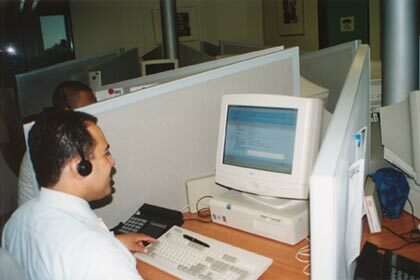 When the operator confirms, the browser sends the phone number to a modem, the operator takes the call on his headset, follows the script and keys in the responses. Upon completion of the call the next company record is automatically retrieved. The script is entered into a database, together with some codes. The hart of the application is an engine, which creates the screens based on the questions and codes from the script. For example, which question on which screen, open question vs. multiple choice, flow of the screens, and so on. This means that creating a new script requires no coding, and can be done by anyone. Expensive programming skills are not needed. Supervisors can create operator profiles, assign operators to specific projects, create or update an account manager's diary and analyze the progress of a project or operator. At the end of the project results are reported internally and to customers. "If I can use LANSA for our outbound marketing solution, I can use it for everything, and we plan to use LANSA for all our program development from now on." says de Vries. "Our RPG developers found LANSA very easy to learn. Within a month they were just as productive as they used to be with RPG, and within two months they were at least twice as productive. Our PC developers needed a bit more time, but they learned LANSA quickly as well." "One of the major advantages of the new system is its flexibility and speediness," say Veling. "In Outbound marketing, customers pay by the hour and to deliver value for money, it is important that we can handle as many quality phone calls in an hour as possible." "Since using the new LANSA system, operators make on average 15 percent more calls each day. All information they need is automatically displayed on their screen and for successful calls the diary of the account manager is updated with a appointment. When the operator finishes a call, the information for the next call automatically pops up, which is a very good motivation to immediately make the next call." "The flow of screens and speed of the system is important for the quality of the phone call as well. The call is more natural as the operator does not have to pause between questions. Another factor contributing to the success and quality of each project is that we can specify the criteria for a target group very precisely, and we have better tools to assign calls to the right operator based on skills and statistics of previous projects." "A supervisor can see, at any point in time, the status of a project and how well each operator is scoring, The online status overview includes the number of companies called, number of calls answered, number of companies to be called again and number of appointments made. Supervisors need 15 percent less time to manage the same number of projects and operators." "With the old system we used to experience some down time. Even 10 minutes downtime is very expensive if 40 or more operators cannot continue their work. The new system is very stable and we haven't had any down time." Ruud Huisman, director of sales and marketing, adds, "We also use the system internally for our own telemarketing and sales. I get better and more immediate management information. Before I only saw results at the end of the project, but now I can see the progress and intervene when needed." "Sales staff can now work from home and save hours of traffic jams per week. Their personal target group of companies is usually in the region of their home. It makes little sense to come to the office every day just to make phone calls. I can monitor their progress at home as if they were in the office." "With our new systems in place we can offer our customers a subscription service that guarantees updates and additions to their target group on a monthly or quarterly basis. This is a huge money saver, and especially attractive to customers with a large target group of prospects." De Vries explains that LANSA has not only improved the efficiency in the sales and marketing area, but also in the IT department. "Program maintenance is easy with LANSA, and the web solution requires only a thin browser client on the PC. Our operators and supervisors don't need heavy PC equipment and we have significant hardware savings." If I can use LANSA for our outbound marketing solution, I can use it for everything. "A major advantage of the LANSA and web technology we have chosen is that we can now provide our telemarketing solution as an ASP service to customers and as a remote service to operators working from home," concludes de Vries. "We have recently made some changes to offer our own marketing solution on an ASP (Application Service Provided) basis. This was only a three week development effort, since the original call center solution is browser based." "There is a lot of interest in our new ASP telemarketing offering, especially for companies with a complex product or a small marketing budget. Labor is a big part of the costs of outsourced telemarketing. Customers can now log in over the web and work in the same productive way as our operators do. By offering our telemarketing software in a self-service environment, we reduced the price significantly. We have opened a new market and are now dealing with companies for whom telemarketing was out of reach before," adds Huisman. "LANSA gives us a competitive advantage. LANSA allows us to focus on the business requirements, rather than technology," concludes Huisman. "We wouldn't have the same internal efficiency or be able to offer our services online without a solid and advanced IT structure. Our services are unique and attract a lot of customers." MarktSelect is an expert in Business to Business database marketing. MarktSelect belongs to the Graydon group of companies. MarktSelect has a staff of 70 and a pool of contractors, many of them specialists in specific business areas. MarkSelect uses a single iSeries (Model 820) for its operations and web serving.